We manufacture an impeccable range of Sheet Pressing Machines for our clients from across the world. This machine is made available to our clients in different configurations as per their specific requirements. We have designed this machine to press the corrugated sheets after pasting of different ply/ lamination. This avoids the formation of air bubbles and maintains an even shape of the sheet. Moreover, our range also provides accurate settings for the freshly glued sheets. The machine is provide with reverser and forward switch for easy movement of machine. 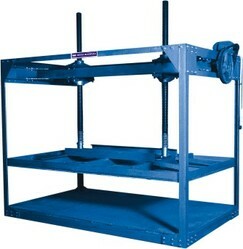 The machine is very sturdy in nature as made from heavy fabricated angles and channels. Sheet pressing machine is used for pressing of corrugated sheet. The glued sheets which are then processed on pasting machine are piles on lower plate & then pressure is applied for some time by lowering upper plate. The pressure on sheets is regularized which gives an even impression to the pressed sheets. Height of Machine 84" 84"
Power Required 1. 5 H. P. 2 H. P.